Is this what it feels like, I thought, losing everything? Steel shutters were clanging down in my head: I dared not even think about my son, just emerging from his teenage years, or of my sorry future. But I could safely bear witness and carry on writing in my head. A correspondent from a hidden war. Paralysed from the top of her chest down, she was to spend almost a full year in hospital, determinedly working towards gaining as much movement in her limbs as possible, and learning to navigate her way through a world that had previously been invisible to her. 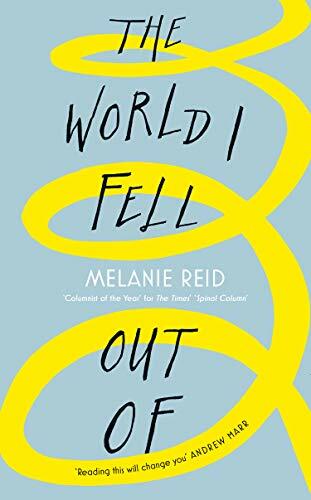 As a journalist Melanie had always turned to words and now, on a spinal ward peopled by an extraordinary array of individuals who were similarly at sea, she decided that writing would be her life-line. The World I Fell Out Of is an account of that year, and of those that followed. It is the untold ‘back story’ behind Melanie’s award-winning ‘Spinal Column’ in The Times Magazine and a testament to ‘the art of getting on with it’. Unflinchingly honest and beautifully observed, this is a memoir about the joy – and the risks – of riding horses, the complicated nature of heroism, the bonds of family and the comfort of strangers. Above all, The World I Fell Out Of is a reminder that at any moment the life we know can be turned upside down – and a plea to start appreciating what we have while we have it. Melanie Reid was an award-winning columnist at The Herald in Glasgow before reporting and commentating for The Times from Scotland and then on the Comment pages. Having broken her neck and back in a riding accident in 2010, she writes her Spinal Column in The Times Magazine every week.